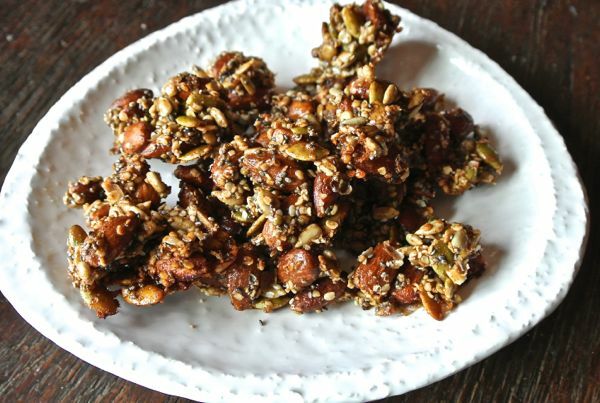 Flavorful and crunchy, these nut clusters are a quick and healthy snack. This recipe was created as I love Kind bars and whenever I travel I toss one in my travel bag. I was on the hunt for different travel snacks for an upcoming trip and voila, this is the result. You can adjust the type of nuts and seeds quite easily. I love the taste of hemp hearts and I tossed in some chia seeds as well because we could all use more chia seeds right? Nuts are packed with protein, fiber and essential fats. 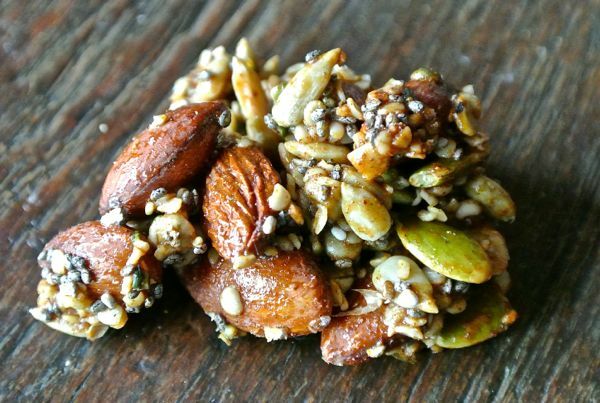 Almonds are calcium rich and high in vitamin E.
Hemp hearts are rich in protein and essential fatty acids. Preheat the oven to 350 degrees and line a 9x13 pan with parchment paper. Mix the nuts and seeds in a large bowl, then mix the honey, molasses, cinnamon and ginger in a small bowl. Toss the honey mixture into the nut/seed mix and really turn to get all the seeds and nuts coated. Remove form the oven and let rest at room temperature for an hour or more until the honey mixture has dried and hardened.